A super RARE find from our Estate Color Stone Collection! IMPORTANT Piece! 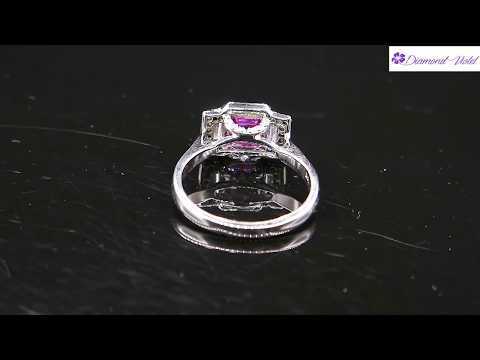 An Amazing VIVID Pink Sapphire and Diamond Engagement ring with AGL Certified 2.03ct Step cut Square Shaped Pink Sapphire, Very Brilliant. Madagascar Origin!! A NATURAL, NOT HEATED, Bright Purplish Pink Transparent Color! GREAT CUT and AMAZING BRILLIANCE, Appears much larger!!! Mounted into a Wonderful 18k White Gold (stamped) 3 stone setting with 2 Large Vertically set Straight Baguette diamonds and accented with small white round diamonds in Pave Halo and on the band. Estimated total diamond weight is 1.00ct, G-H color, VS-SI clarity over all. The diamonds are even underneath!!! The measurements of the Entire outline of the top are 9.46x13.68mm. This Amazing ring can be worn as an Engagement ring or as a right hand ring! Sits nice and low from the top of the finger: 7.02mm. The band tappers from 1.77mm to 2.36mm on the bottom. Finger size is 8 ¾, easy to re-size, the weight is 4.8 grams, Solid. The ring is in very good vintage condition. Minor evidence of wear in form of tiny scratches to the metal. No sign of wear to the stones. Comes in a Gift Box with The Original AGL Certificate and an Appraisal. 14 Days Money back minus shipping, buyer must notify seller within 3 days of the items receipt of his/her intent to return.